Within the Marvel Universe, Iron Fist is a kung-fu warrior of a secret order that's pretty used to dealing out a bit of black and blue to those who oppress the everyman. In RZA's directorial debut on a Quentin Tarantino film, The Man With The Iron Fists mixes copious amounts of that same kung-fu feeling with 19th Century China, to bring more great over-the-top battles, weapons and martial art action to the big screen. Heck, Wu-Tang Clan is even on soundtrack duties and Kill Bill-er Lucy Liu is even in there too. So suspend your reality for a few minutes of cool. Check out the IGN released trailer below and see how a man whose fists are actually iron actually brings the pain. Yeah I saw this trailer over at Dj swann's blog and it looks absolutely awesome! I knew RZA and the whole Wu-Tang clan(kung-fu influenced their name)were big 70's kung-fu fans, and it shows here. Great job on the stunts, action, choice of actors, and cinematography. Mr Crowe is an unusual one Dale but I'm interested! Infact I just might watch Kill Bill tonight just to get in the zone. I heard about this film but this is the first time I've seen the trailer. Fantastic! Being a big fan member of the WuTang Clan already, I can't wait to see the film. Right off top it loolks like the superhero Kung Fu action I've been waiting for in comics, animation and movies. Thanks Dan for this one. Thought you'd like this one OA! Marvel so needs this feel back in the line. Like with Cage, and Shang Chi they already have this potential just waiting! exactly what I was thinking. This feels like what Marvel could be. 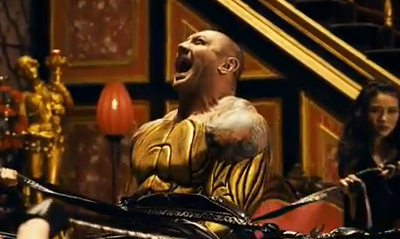 The metal guy is showing and is probably going to do what Collosus never did in the X-Men movies. I loved the immortal Iron Fist series, this movie also says something about the seven cities. I'm going to admit that I felt the knife in my side turn when there wasn't a city represented in the book. This movie has everyone represented as is the true world shows.